Vorsprung durch Technik, or “Advancement through Technology”, has been Audi’s tagline for the longest time. And nowhere is this more evident than in their latest flagship limo, the A8. According to Mirko Reuter, Audi’s head of autonomous technology, the new A8 gets a mind-boggling list of over 40 driver assistance systems. Topping the list, I had a first-hand sampling of the A8’s AI Traffic Jam Pilot. 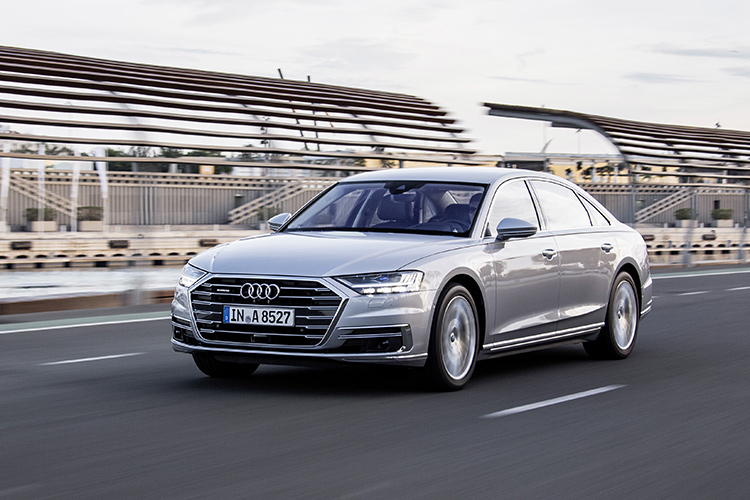 With Adaptive Cruise Assistance (ACA) activated, and a press of the AI button, the A8 was able to self-drive in a simulated traffic jam scenario, at speeds of up to 60km/h, sans steering or pedal inputs by me. The A8 is said to be the world’s first production car with this Level 3 autonomous drive feature. Weird and unnerving to me initially, the experience included reassuring fail-safe warnings to alert the driver to retake control at the wheel whenever traffic or road conditions require it. Otherwise, I just sat back and relaxed in the traffic crawl. Sophisticated “private jet” cockpit, thoughtful “business class” comforts and ample “first class suite” amenities make the new A8 a great German limo. It’s just bragging rights for now, though. 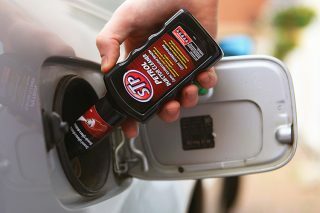 Traffic Jam Pilot will still have to obtain country-specific regulatory approvals in due course. Other Audi AI firsts are Parking Pilot and Remote Garage Pilot. 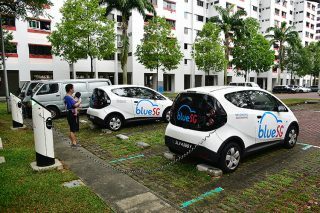 The driver doesn’t even need to be at the wheel for these to operate, he just uses a smartphone app. It’s a surreal out-of-car experience. Working with the Audi AI and other assistance systems are 24 surveillance sensors strategically located around the A8, including ultrasonic sensors, cameras, radars, an infra-red camera (for night vision), and a world-first laser scanner. All the sensory devices feed into a central controller (called zFAS) processing the data inputs. That’s a lot of energy-sapping processing going on. 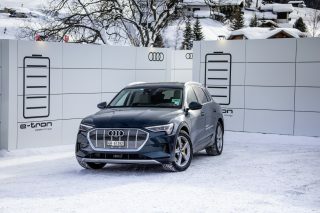 Hence, all the latest A8s, except the top-of-the-line 60 e-tron, are mild hybrids with a 48-volt lithium-ion battery pack system as standard. This supplementary battery does encroach into boot space, if ever so slightly – 505 litres (15 litres less than the previous A8 L) just about trails the competition. In fairness, the boot is practically shaped and useful enough. Another Audi AI innovation is active suspension with electromechanical motors. 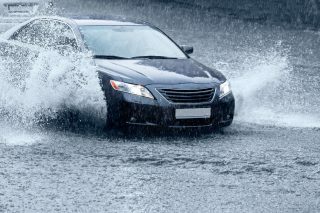 Each active-suspension element can raise or lower predictively over dips or humps which lie ahead, for an uncannily level ride over bumpy roads. Add Audi’s pre sense 360º safety system, and the A8 will even be able to rise within a split-second (by 80mm on the impact side) to brace for an imminent side-impact collision. Kerb warning (to protect expensive alloy rims) and exit warning (with door-opening delay to “avoid” a passing vehicle or a cyclist from behind) are some of the other monitoring innovations for the A8. 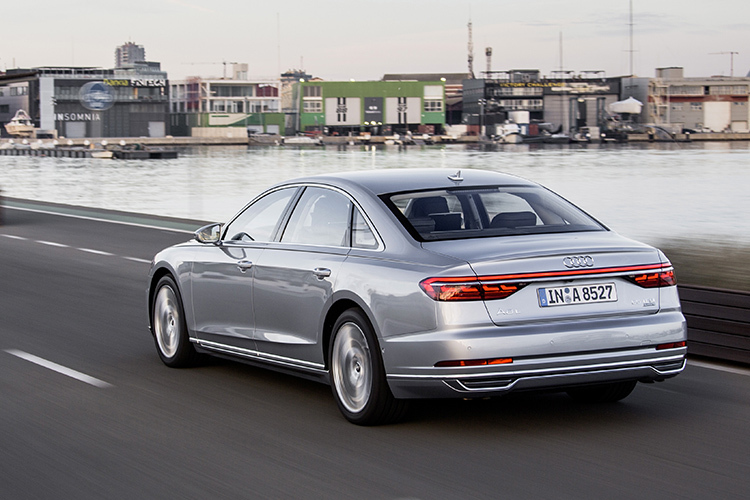 If the outgoing A8 L is already an upsized luxo-barge, the new model is even bigger. It is 5302mm long (+37mm), 1488mm high (+17mm) and a mite narrower at 1945mm wide (-4mm). And the wheelbase has been extended a tad to reach 3128mm (+6mm). 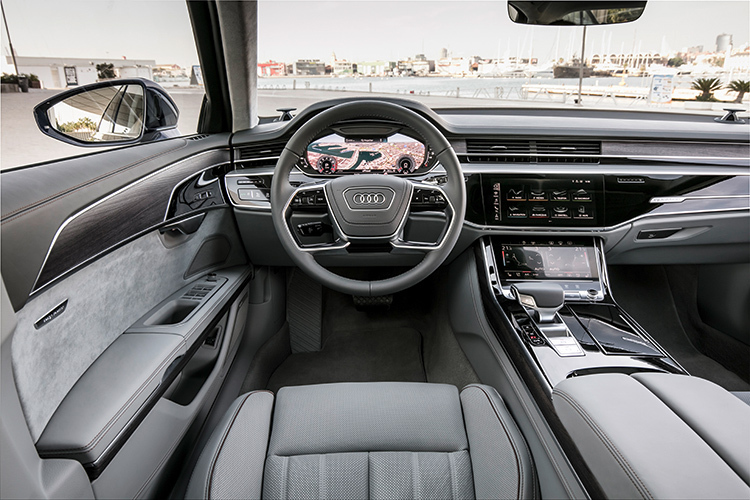 The newcomer does, however, manage to play down its physical size with a lower shoulder-line, a wide hexagonal single-frame Audi grille and lateral chrome trim highlights, all making the new A8 L appear wider and leaner in the metal. Sharper LED headlamps and elongated tail-light clusters complement the lean look. 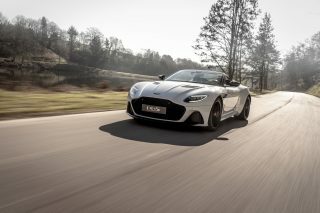 Those tail-lights now come with an LED strip extending across the full width of the boot, creating a new signature appearance and a dynamic lights show at the rear. HD Matrix LEDs and OLEDs are optional for the front and rear lights, respectively. As a whole, the A8’s design is one of discreet and understated elegance, intrinsic to Audi’s DNA. Although the new A8’s Audi Space Frame (ASF) architecture is 58 percent aluminium, with a dash of carbon fibre even, the application of more lightweight high-strength materials isn’t enough to offset the extra weight of the on-board hybrid battery and high-tech hardware. Hence, the new A8 L 55 TFSI is slightly pudgier, weighing in at 1945kg, 65kg more than the outgoing equivalent. But performance hasn’t been compromised. 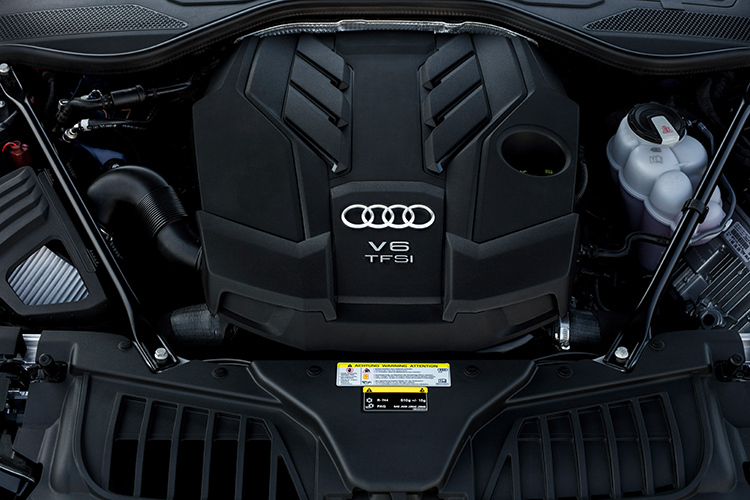 The new 3-litre V6 turbo 55 TFSI engine puts out 335bhp (+29bhp) and 500Nm (+60Nm), enabling a respectable 0-to-100km/h sprint of 5.7 seconds, 0.2 of a second faster than the old version. That said, in the limousine segment, ride composure and cruising refinement are more vital. This is where the new Audi flagship excels. On the standard adaptive air suspension, it glides over city street irregularities, and remains reassuringly rock-steady on highways. When the roads get twisty, quattro (all-wheel-drive) enables the A8 to corner flatly as though on rails. The Audi A8L offers a very composed ride, a highly refined cruise, rock-steady handling and state-of-the-art driving features. I’m content leaving the Audi drive select mode in its intuitive Auto mode, letting the car determine if I should get naughty (Dynamic) or nice (Comfort). Our test car came with dynamic all-wheel steering. Below 60km/h, the rear wheels will turn (by up to five degrees) in the opposite direction to the front wheels, enabling a smaller turning circle (by a maximum of 1.1 metres). 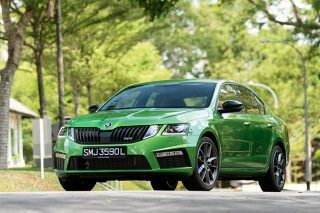 Above 60km/h, the rear wheels follow the front wheels (by up to two degrees), inducing more stability. This makes the A8 feel one size smaller and nimbler. But on narrower roads, you will still need to be mindful of the saloon’s sheer mass and girth (2130mm wide, including mirrors). For a quick comparison, I managed some drive time in a pre-production A8 L 60 TFSI. Yes, the 453bhp 4-litre V8 has more muscle under the hood, but during my brief acquaintance, it behaves very much like the 55 TFSI, except with a whisper more V8 vocals when pushed. The (optional) AI active suspension of the 60 TFSI also keeps the V8 A8 cruise ship steady, regardless of tarmac conditions or speeds. It’s a swifter limousine, but no sportier than the 55 TFSI. 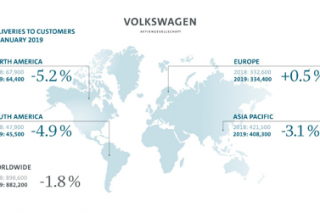 With this vehicle being a ride for boardroom head honchos, its rear cabin is critical. 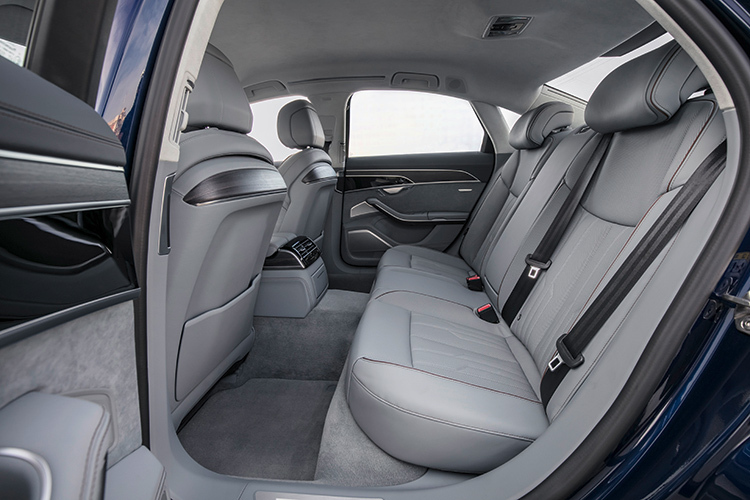 The outgoing A8 L is already a roomy luxury carriage, and the new one is even more so. Whether with the standard three-seater configuration or the optional two-seater configuration (as tested), there’s abundant legroom for the towkay to stretch out. Ventilation/massage/multi-adjustment functions for the seats, directional matrix LED reading lights and a two-piece panoramic roof are some of the business class options. Add the 23-speaker B&O 3D Advanced Sound System and you have a virtual concert hall on wheels. Is the A8’s backseat the best seat in the house? Possibly, if you specify the relaxation seat package. This upgrades the businessman in business class to first class with a “boss throne”, which includes a soles-massaging footrest tucked behind the front passenger seat. 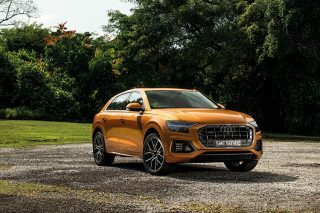 This is another first from Audi. Sitting back to relax when caught in a traffic jam has never been more inviting. Vorsprung durch technik, or advancement through technology, is evident in Audi’s latest flagship limo. Not to be overlooked, the A8’s cockpit-dashboard is a statement of Audi’s latest clean-design aesthetics and even more technology. Audi’s familiar 12.3-inch Virtual Cockpit is now in full-HD glory. 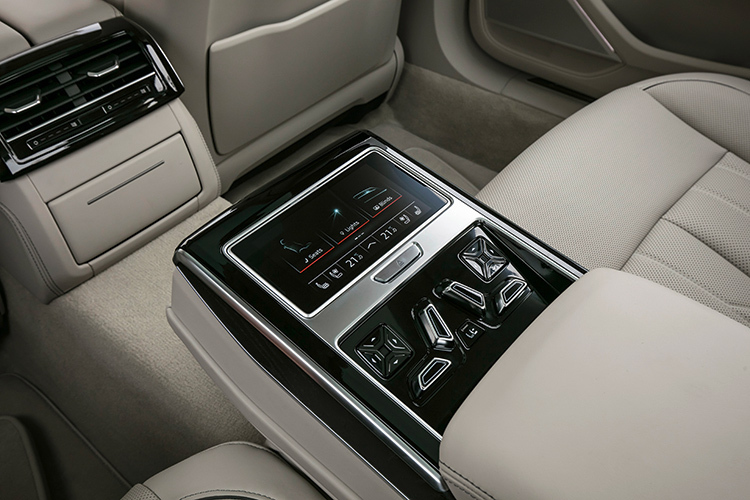 Equally high-tech are the double-stacked touchscreens on the central dash-console, minimising buttons and dials. The lower 8.6-inch panel is for seat and climate controls. You can also customise your favourite controls onto it. The A8 is the first Audi car to replace the MMI control dial with MMI touch response, with the screen becoming your scribble pad. The upper 10.1-inch panel handles other controls. It’s also the navigation map screen and the graphic display for the Playstation-like 3D camera views of the vehicle and its surroundings. Like with smartphones, everything is just a press, pinch, swipe or slide away, complete with haptic touch and acoustic “click.” It’s all pretty intuitive, and less gimmicky than BMW’s sci-fi gesture control. Siri-style voice-activated controls are part of the package. The new Audi A8L is the brand’s most futuristic flagship ever. The cabin exudes a modern lounge ambience, with flush surfaces and uncluttered lines. The dash air-vents shut behind trim panels when not in use. The quality is beyond reproach, with the perforated leather, open-pore wood, piano-black surfaces and brushed aluminium all adding to a very deluxe interior. 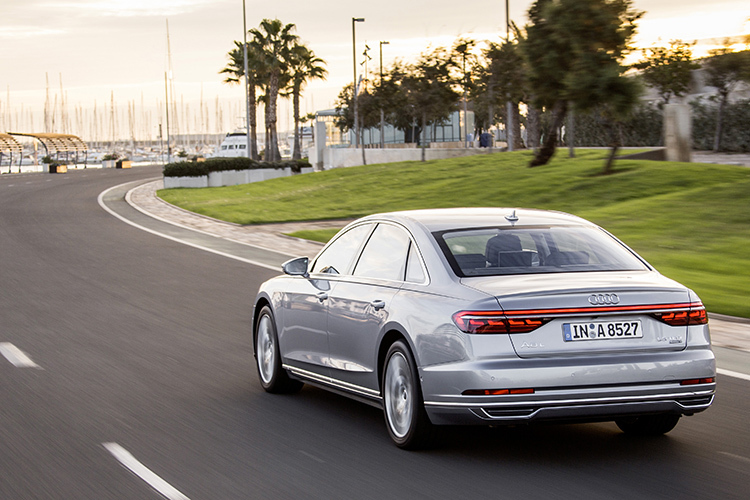 Will the A8 be able to sway towkays away from their wafting gold-standard S-Class? And how about the affluent enthusiasts’ smile-inducing 7 Series? I wonder. In any case, the new-age A8 is Audi’s most futuristic flagship ever and a showcase for the automaker’s cutting-edge technology. 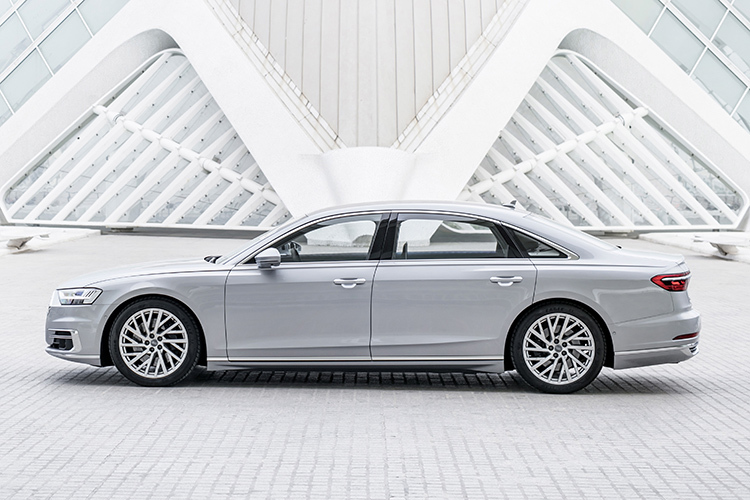 What’s more, it betters the outgoing A8 by providing more pampering comfort, a nimbler drive and enhanced safety. Audi Singapore plans to launch the 3-litre V6 A8 L 55 TFSI quattro in mid-2018, followed by the more potent 4-litre V8 A8 L 60 TFSI quattro thereafter.